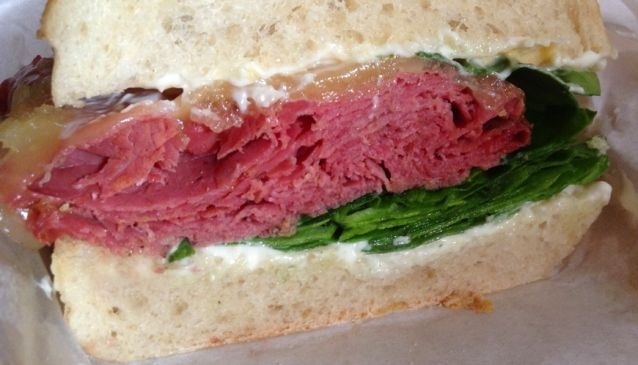 The Pig & Heifer has been bringing genuine New York delicatessen foods to Dublin since 1996. Boasting an original Big Apple recipe for pastrami, The Pig & Heifer were the first in Ireland to serve 'real' pastrami on rye. And they still make a mean sandwich. The Pig & Heifer insist on using the best, freshest breads and meats delivered by butchers rather than processors. Vegetables are obtained direct from Smithfield market and are prepared freshly every day. Cheeses are sourced from artisan producers in Ireland, Italy, France and Spain, and most of their sauces and soups are made from scratch. Today in four city centre outlets (also in City Quay, Amiens Street and Charlotte Way) The Pig & Heifer offer a huge range of the finest ingredients in their range of delicious sandwiches, made with care and bursting with unique flavours and textures.